Beckett Message Boards - Two Boxes of 2004-05 ITG Franchises Update! Jolly Good Fun! Beckett Message Boards > Hobby Talk > Hockey > Box Breaks > Two Boxes of 2004-05 ITG Franchises Update! Jolly Good Fun! Full Version: Two Boxes of 2004-05 ITG Franchises Update! Jolly Good Fun! Last weekend I took a trip to the local mall to look for some birthday gifts for my dad. While walking through one of the usual overpriced card shops, I stumbled across two boxes of 2004-05 ITG Franchises at a price that I found rather fair. Each guaranteed an autograph and a memorabilia hit and since these don't pop up too often at all, I picked them both up...for myself, not my dad, he is less into cards than myself. I only got around to scanning the both of them now since the life of law enforcement rarely gives you time to do whatever you want whenever you want. 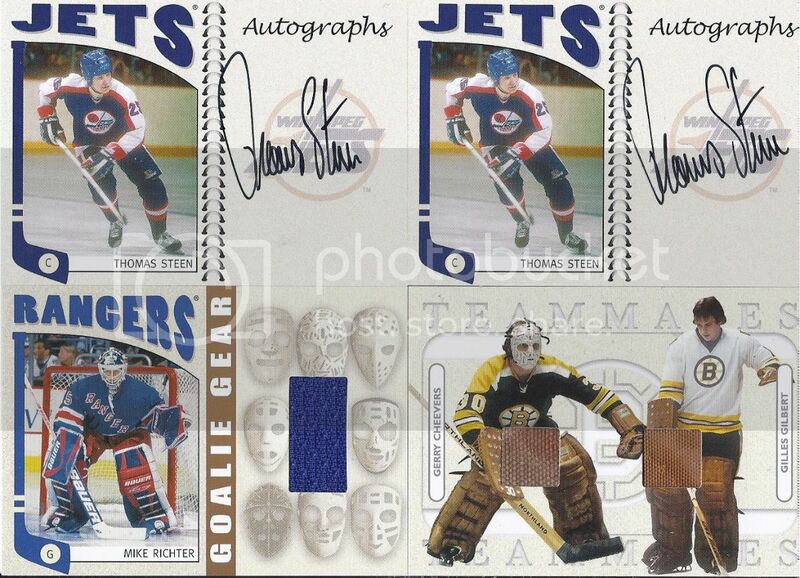 The first box yielded a Thomas Steen autograph and a Mike Richter Goalie Gear Gold Version #/20. The second box yielded a...Thomas Steen autograph and a beautiful Teammates Dual Memorabilia card #/60 of Gerry Cheevers and Gilles Gilbert. Everything is for sale on other mediums except the Cheevers/Gilbert card (believe me, I like it so much BV high isn't enough to get it from me). That Cheevers/Gilbert is super cool. Talk about a great pull for a goalie collector! That's a nice Cheevers. I pursued his cards for a while, but gave up a few years back. It's cool how much of his memorabilia are pads, rather than just jerseys. Sorry to hear that you got 2 Thomas Steen autos. I feel like Richter memorabilia is not that easy to come by, so kudos there. Yup......you have another Richter waiting for me Nice stuff.